Anyone have a prediction on how long it will be before the Hooch will be fishable (safe) for the typical wading fly fisherman? I checked the Lake Lanier level today and it is 3.4 ft above after 60+ hours of full discharge which started Saturday at 12:01 AM. Levels at Jones Bridge look to be 10 ft vs the normal 2-3 ft. There's a lot of water to move. Based on a real rough estimate of them pulling 5.5billion cubic feet of water off the dam at 5,500cfs, it should take 12 days of release to draw it down. Then burn the entire ram on the altar. It is a burnt offering to the LORD, a pleasing aroma, a food offering presented to the LORD. God loves BBQ! Also, add a foot to that. Full winter pool is 1070ft asl not 1071 like in the summer. It will probably take a good 14 days or more. "Everyday is a new life to a wise man." "We are what we hunt." It’s gonna take a bit more split shot to get those euro rigs down in the sweet spot with those kind of flows. My guess is that they are "pulsing" the releases for the maximum volume while minimizing downstream flooding. Last edited by natureman; 01-07-19, 10:18 PM. Oh good, I was afraid the ACE had accidentally linked to a stock market site. My guess is that they are "pulsing" the turbines to release the maximum amount while minimizing downstream flooding. That or they be stopping on regular bases to clean the intake screens. I'm sure the debris load is heavy. Debris on the intake side has not been a problem. The trash rake that was part of the Powerhouse construction was removed due to lack of use many years ago. 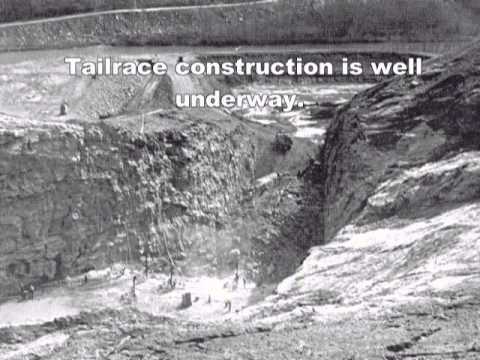 In this video at 5:11 you can see the intake under construction and before the lake was filled. Cool info Natureman, not the "typical" construction that I see here in TVA land, as there intakes at or near the surface. Loved the video! Naturemann. Thank you once again for your posts. You dispense so much knowledge and history. Its appreciated by the younger crowd. My guess is Feb 1st. I like em big fat and sloppy. Who knows? With more rain on the way next week, they might stop it for a day or two to avoid downstream flooding right around those rainy days. So you might have an opportunity to wade the dam around then. After that, 24/7 again for at least 3 weeks probably. Hi my name is Charles and I'm a fishaholic. Some days I'm the hook and some days I'm the fish. That video was amazing. How long did it initially take to fill the Lake? O Feb.1, 1956 the gates were closed and the lake began filling. In May, 1959 the lake reached its full level for the first time. For those interested in Lake Lanier history, David Coughlin's book "Lake Lanier A Storybook Site" is the definitive account. All times are GMT-5. This page was generated at 09:33 AM.